A fan of golf ... only in summer! Springbok tighthead Vincent Koch talks about playing ‘grandpa golf’, a brutal round at Le Golf National, going into ‘golf hibernation’ in winter and gatecrashing a fourball, writes WADE PRETORIUS. I was quite young, probably about nine or 10 years old. We lived near a golf course, so my brother and I would trek off there. We didn’t take it too seriously, it was more about being outside like ordinary South African boys. I took a long break from it until about a few years ago and I’m loving it again. I’m definitely a summer golfer, you know; maybe even once a week when the weather is good. In winter, I go into hibernation and do a few other things. It’s no fun being outside in the rain or wind in the UK. Safe to say, I have not. Although I did get close once. It’s just a great way to be outdoors with friends and it’s a great way to get my mind off my day job. I know the game is stressful and frustrating, especially when you play off a 16, like me, but it’s also full of laughs and jokes. As a bruiser on the rugby field, do you try to bruise the ball into the hole? Or is there more finesse to your golf game? No [laughs], that’s for rugby only. The harder I try to hit, the more wayward my game goes. My drives tend to fade quite a bit and there’s no real distance to gain. ‘Grandpa golf’ is the way for me… just try to keep it straight with a lot of punches and rolling the ball on to the greens. Nothing too flash from my side, unfortunately. Recently, I put the Cobra One Length irons into my bag and it’s been amazing to see the improvement. My longer irons are going straighter and further, so that’s been great. Tiger Woods, Gary Player, Rickie Fowler and Dustin Johnson. I’d crash it and make it a fiveball. It would be great to walk around with these legends. And DJ is a real bruiser, which would be cool to watch. Having played for the Bulls, Stormers and Saracens, which franchise has the best golf courses? That’s pretty easy – Pearl Valley is an incredible experience from start to finish. I’ve played courses around the world, but ‘the Pearl’ stands out. You played a round at Le Golf National shortly after the Ryder Cup. Was it as hard as the Americans made it look? It’s even worse than they made it look. We decided to go full out and play off the championship tees… the fairways are so narrow and the carries off some of the boxes are so long. It was brutal. It does make the Europeans’ performance even more impressive. The course was in amazing shape and it was a real treat to be out there and take it all in so soon after the Ryder Cup. What is your handicap at the 19th hole? If Schalk Burger is a scratch, I’m about a nine or 10. I enjoy it, for sure; it’s a great way for the team to wind down and share some jokes, with a few fines for the mistakes that invariably happen. I love the game. It can be tough to secure the remote for four straight nights, so I save my golf for the weekend and I’m up all night watching and trying to learn. The pros are on another level and it’s hard not to sit glued to the screen and marvel at their skill. Which pro player would you nominate to make a 20-footer to save your life? I would’ve said Tiger Woods for the past 20 years because he’s been a golfing role model for me. But at the moment, I think I’d have to bank on Justin Thomas to make sure I survive. 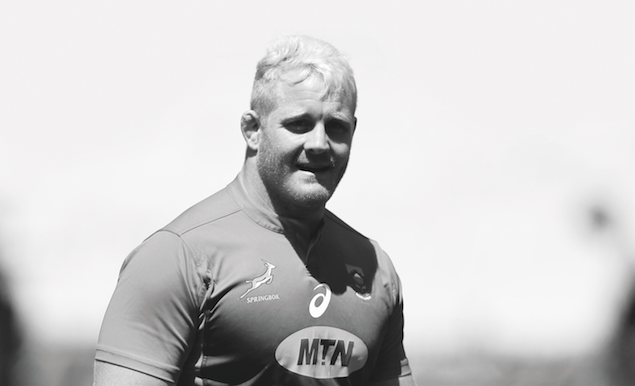 Now a 13-Test Springbok prop, Vincent Koch emerged on to the scene at senior level while on duty for the Pumas. His impressive work rate, scrumming ability and play in the loose saw him drafted into the Stormers Super Rugby franchise in 2015. The burly character continued to show improvement, and was handed his Test debut later that year at Ellis Park against the All Blacks. Koch is plying his trade with Saracens in the UK as he looks to play his way into the South African squad kicking off their World Cup 2019 campaign in September.